It’s been a good long while since I’ve made a black and white photograph. A quick look at the archive reveals other than a onetime blip back in April, it had been since August of 2015 that I had made a proper black and white. Too long! I really like black and white, and I really like this shot. It’s sporting all the key ingredients required for a well executed black and white photograph—macro or otherwise. 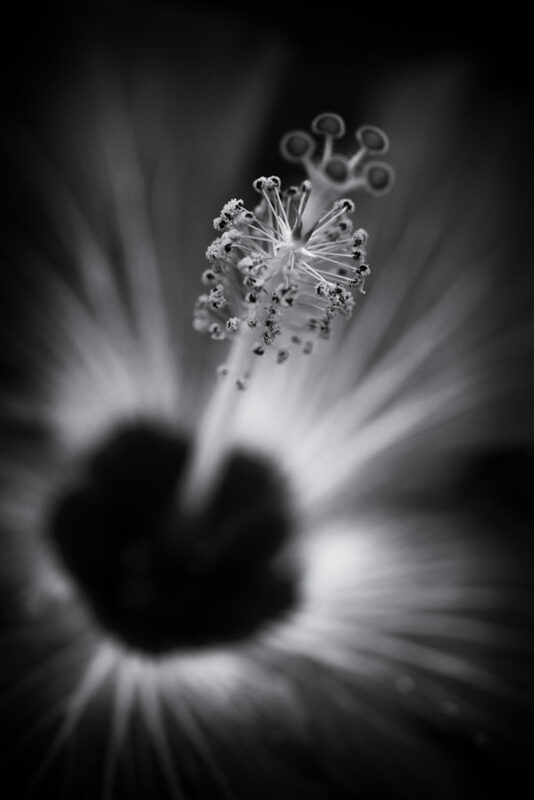 The composition is strong, moving the eye from the deep darkness of the bottom left corner up and through the stamen and pistils of the hibiscus flower. The selective focus adds moodiness and depth to the photograph, enhancing the sharpness of the pollen resting atop its anthers. But what really kicks this into black and white overdrive is the contrast; the dramatic shifts from near total black to the intensity and brightness of near total white. The image runs the grayscale gamut and locks away the final dimension necessary for a fine low key finished product.